In recent years, special occasions have been bringing back nights where Hollywood Boulevard is lit up by the cackle and shimmer of fireworks. Of course, the view on those nights isn’t exactly what it once was. This photograph is from 1990 and shows the immensely popular Sorcery in the Sky, the original nighttime spectacular for Disney-MGM Studios. 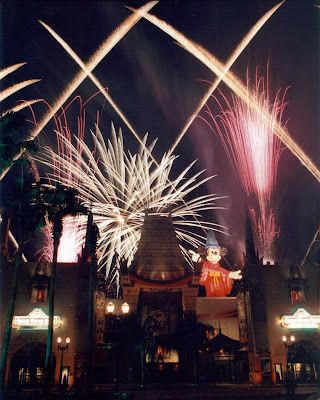 Narrated by Vincent Price, the show featured selections from film scores, including Star Wars, Mary Poppins, The Wizard of Oz and other favorites that could be found in some capacity inside The Great Movie Ride, synced up to special lighting effects and firework displays. During a section dedicated to Walt Disney’s dream, Fantasia, an inflatable Sorcerer Mickey swelled up atop the theater’s roof. Oh, and did I mention that the Rocketeer even made special flights during shows in 1991? The show was replaced in 1998 by Fantasmic!, but the original spectacular is forever etched into the memories of those who experienced it. It may not be the same show with the same poignant lighting elements when it is seen today, but it is good to know that Sorcery in the Sky has not completed disappeared from the landscape and showmanship of Disney’s Hollywood Studios! Part of the magic to be found and enjoyed in the parks of Walt Disney World is the music that envelopes the experience. The soundtrack of your trip is perfectly in tune whether you are taking on an adventure, embarking on a quest to recapture childhood memories, or just finding a quiet place to rest. Even in the pool and lobby areas of the resorts, you’ll get to see the lay of the land and hear to score of the land. But what about when you venture to those corners that are off the beaten audio? Obviously, there are some areas that you don’t want to be inundated with music. Take for example the campground loops of Fort Wilderness. With the song of nature all around you, do you really need sweeping pastoral symphonies or the strings of the frontier twining in between the campsites? Of course, Fort Wilderness does include speakers primed with the Settlement musical loop all the way out on the beach along the shores of Bay Lake. 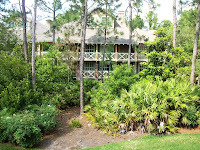 The resorts, however, are without sound for copious amounts of time. Save for Art of Animation, once you leave any value resort’s main hub of activity there is no music around the buildings or various courtyards. 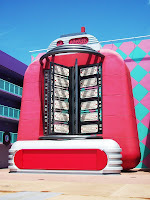 How great would it be for Pop Century to utilize the popular music they promote all throughout the buildings dedicated to a given decade? Stadium anthems in All-Star Sports? Classic Disney animated soundtracks attached to the walkways of All-Star Movies? Moving up to the moderate resorts, who wouldn’t want to be beckoned to the streets of Port Orleans – French Quarter by the sweet sounds of an omnipresent, but invisible, jazz procession. Latin beats would have guests strutting and salsaing around the Coronado Springs promenade. Deluxe resorts, with even more impeccable thematic elements, could further immerse their guests by spreading the sounds of Hawai’i that fill the Great Ceremonial House. The lists could go on and on, but I’m fairly certain you get the idea at this point. 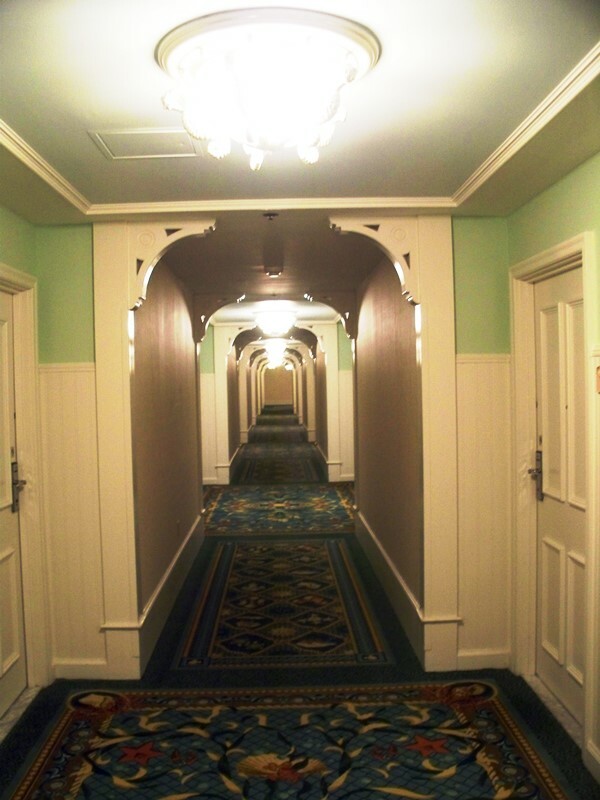 I understand that guests may not want to hear music wandering in from the hallway where the resorts have internal hallways for guest rooms. However, the background music is create to blend into the background, to highlight guest areas, not to be the primary focus. 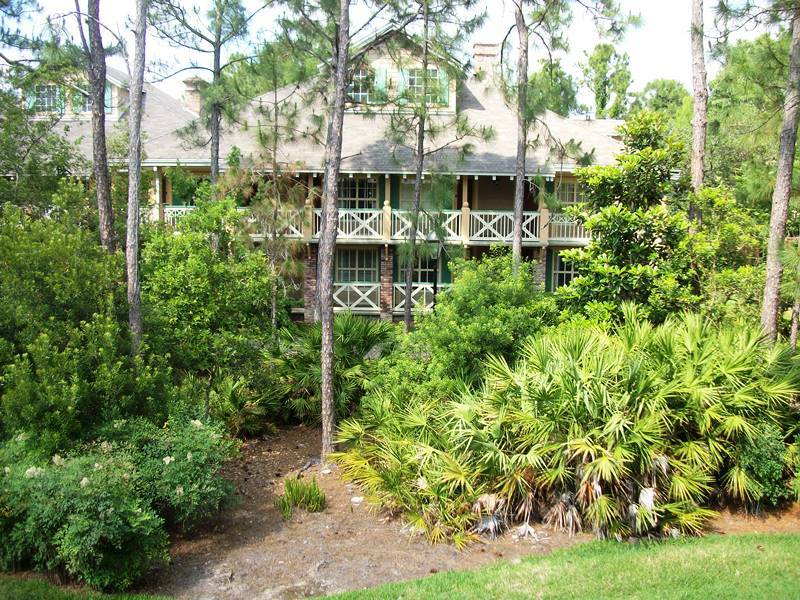 Resorts with the exterior entrances to the rooms, paired with a quiet background loop could do wonders for guests. In addition to help set the scene told by landscaping, architecture, and décor, the music is a gateway into cultures from around the world. Guests may not recognize a particular piece of music, but after just a few minutes of exposure they would gain an understanding of what is important to a particular culture’s music. Okay, so guests are on vacation and don’t really want to learn on their time-off, and I’m going to ignore the fact that guests pour into Disney’s Animal Kingdom and Epcot every day, what about its use as a sound buffer? 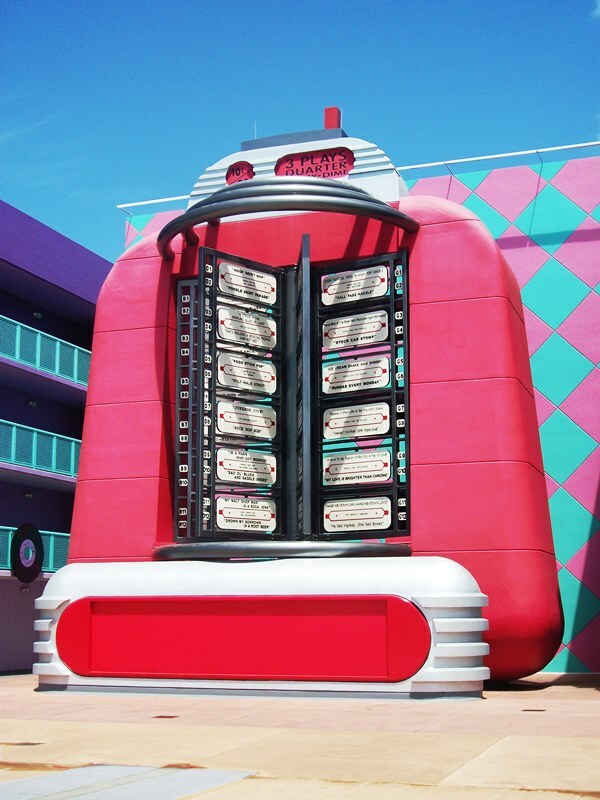 Think about those times you’ve spent along a popular corridor of All-Star Sports or Pop Century. Remember the raucous bunch of kids and teens that continually ran by your door scream and squealing? I’m willing to bet a bit of music, even if you couldn’t hear it in your room, would add a bit of sound suppression when those excitable younger guests come rampaging down the hall. The music of Walt Disney World is just a single piece of the tapestry that creates world-class environments all throughout the Vacation Kingdom. When the band stops playing there is a void left. 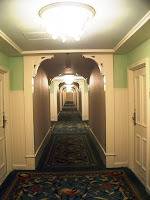 Guests may not notice it and may not be that concerned with it, but in the resorts where audio is present along the walkways and the courtyards, it makes a huge difference in how guests identify with the story they are being told. Shouldn’t that be the goal, to tell the story without the guests even knowing they’re being feed information? I hope that one day, we can all wake up to perfectly cued music just outside all of our resort doors. To celebrate the fifteenth anniversary of Disney's Animal Kingdom we turn to Joe Rohde's presentation from the park's tenth anniversary. Mickey's favorite recipes are pulled together Cooking with Mickey around Our World. Sanaa's African Starr Mojito is just the beverage to help wash away a hectic day of touring. The World News Roundtable discusses the Monsters University monorail wrap, interactive pirate games, the upcoming release of the Mickey Gets A Horse short, and the refurbishments of the Disney Magic cruise ship and BoardWalk Bakery. 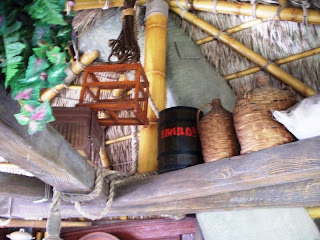 There are all kinds of cocktails and spirits in the Magic Kingdom, you just have to know where to look! Silent Saturday takes us the Art of Animation's Wheel Well Motor Court. Over at This Happy Place Blog, Kimberly Michelle lays out the 1995 press release for Disney’s Wild Animal Kingdom. 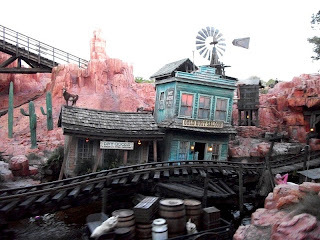 Continuing her music education series, FoxxFur puts on the Main Street, U.S.A. evening loop that ran from 1976 – 1991 for readers of Passport to Dreams Old & New. 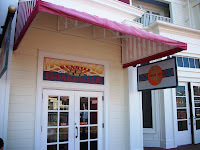 AJ Wolfe has a first look at the newly refurbished BoardWalk Bakery on The Disney Food Blog. We are reminded of Future World Brass by Mouse on the Mind and Melissa Sue Sorrells Galley. Sarah Holodick has pictures of the changes to Sanaa’s menu at Eating WDW. Disney at Work sits J. Jeff Kober down with Rick Barongi to look at the creation of Disney’s Animal Kingdom. Safari Mike offers up his take on the festivities for the fifteenth anniversary of Disney’s Animal Kingdom on Jambo Everyone. Capt. Cook’s is on the menu for Melissa Knight Coulter and Disney on Wheels. Nicole Siscaretti weighs in on the Glass Slipper Challenge at Sparkly Ever After. May the 4th Be With You events at Disney’s Hollywood Studios are chronicled by Studios Central and Matt Hochberg. Richard Tobin lets readers of Mouse Troop in on how to navigate the rope drop crowds at Cars Land. I stopped by the WDW Radio Show this week to highlight some of the secrets of Disney's Animal Kingdom with Lou Mongello. Check out Episode 321 for all the secrets, tricks, tips, and food from the fourth gate you can handle! We've been playing Disney Post-It Trivia on the Main Street Gazette's Twitter page recently. Come by and join us Tuesday night at 8:00pm EST with your questions about Walt Disney World history, food, favorites, or anything else you can think of! I'll answer the as honestly as I can, with some pictures and wit thrown in for good measure, all on a handy-dandy post-it note! When Be Our Guest opened to the public in late 2012, there is a great big hullabaloo about the fact that it was going to serve alcohol. 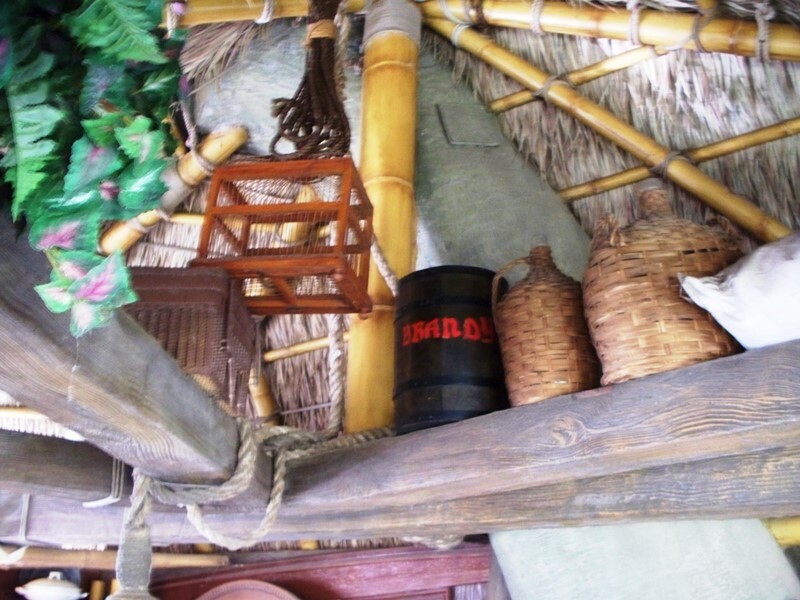 Since the park opened in 1971, the argument stated, there had never been alcohol available for consumption inside the Magic Kingdom. I guess the ‘consumption’ part is the key to the entire situation, because there has always been alcohol tucked away in the quiet corners of the park. Let’s explore, shall we? 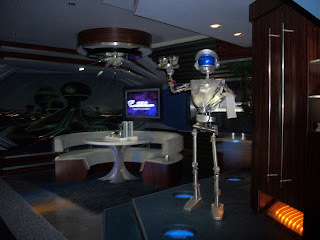 Let’s start out in Tomorrowland, where the robotic servant has whipped up a batch of cocktails for parched guests who have just survived a harrowing journey through Space Mountain. This friendly fellow arrived in 2009 after a lengthy refurbishment of the attraction. After a bit of a stink was raise about the content of the glasses, though what specifically they held was never actually revealed, although all signs seem to point towards a martini of sorts, it was given the appearance of a more family-friendly Kool-Aid type beverage. After a hard day in the mines, it is clear the folks of Frontierland have to have a beer or something stronger to wash away the day. Tumbleweed, the town in which Big Thunder Mountain is set, features the features the Gold Dust Saloon and there is another just down the road in the diorama that comprises the Frontierland Shootin’ Arcade. 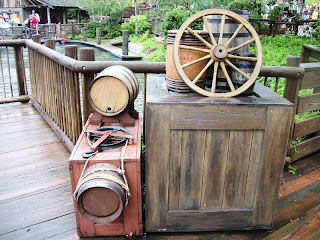 The saloons, however, are just empty taverns without something to serve if they aren’t stocked up, and you can find crates of spirits all throughout Frontierland. Whiskey can be found all throughout the land, including in the supplies for the Big Thunder Mining Company and stashed along a dock on Tom Sawyer Island. My personal favorite would have to be the Irish Blend known as O’VERDIGUMS. Think about it for a minute, it’ll come to you. 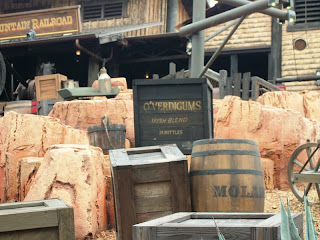 Of course, the biggest wretched hive of drunkards is Adventureland. It is out with the whiskey and in with the rum in this land. 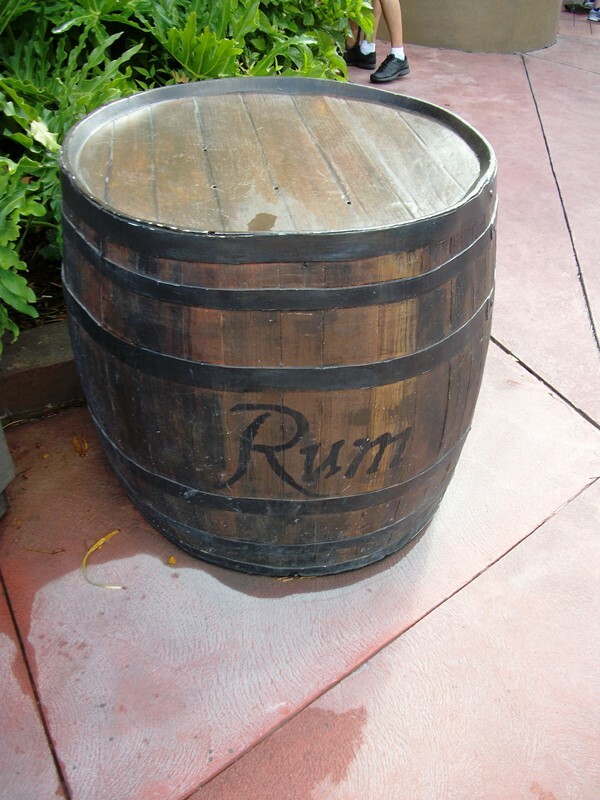 There are plenty of examples of rum casks scatter all over Caribbean Plaza, but this ridiculously enormous barrel that is part of the set decor for Captain Jack Sparrow’s Pirate Tutorial really says all that needs to be said about pirates and rum, and I right? 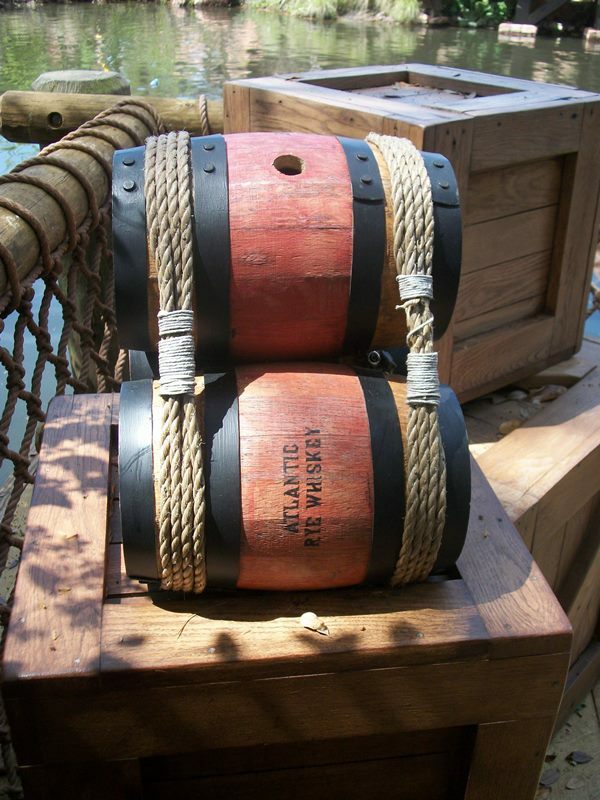 That being said, pirate rum isn’t the only adult beverage to be found inside Adventureland. Down the winding lane a bit you’ll find the Swiss Family Treehouse. Tucked away in the rafters, for that special occasion or the day when Ernst is just being, well, Ernst, is something special for mama and papa. I imagine we’d all need a nip of brandy every once in a while if we were trapped on an island with our families with no idea when, or if, we’d be rescued. There are plenty of other spirits to be found all throughout the Magic Kingdom, if you know where to look and listen (I’m looking at you Sam Clemens and your crack about the Haunted Mansion!). I know the actual serving of alcohol inside the Magic Kingdom is a serious discussion, and one we may touch upon one day soon, but for now I hope we can all loosen up and have a little fun. These are great details that help set the scene and create a true sense of who lives in these magical lands. Because, trust me, a sober pirate is no fun at all! Here we go again. The Walt Disney World monorail system has received another new promotional wrap. This time, they’re promoting their big summer release, Monster’s University. 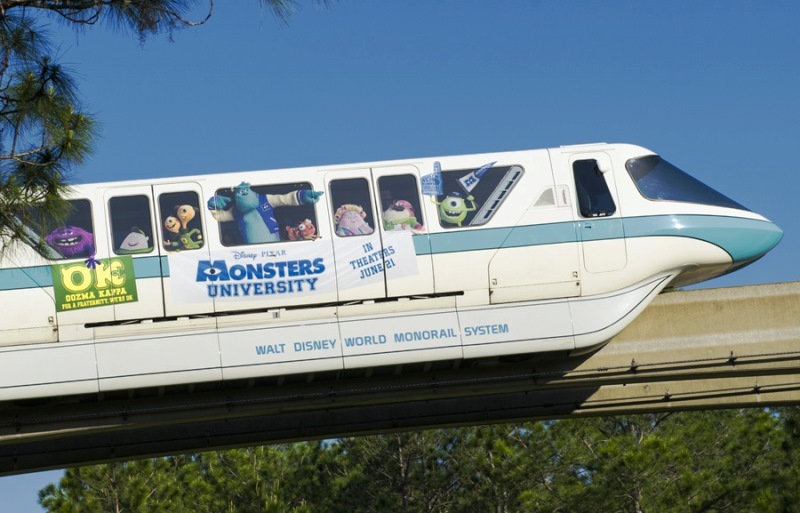 This new wrap features Sully, Mike, and the rest of the monster student body riding in the monorail and promoting their University and their favorite fraternities. This particular wrap is not as encompassing as Tronorail, Avengerail, or IronManorail. While those wraps covered the entire train from nose to tail, this wrap only places the monsters in the windows of the cars with various signs hanging down. In fact, I almost hesitate to call it a wrap. It seems more like decoration similar to the Year of A Million Dreams embellishments that were added back in 2006. Every time a new monorail wrap is announced, the battle begins anew. Is this a harmless and temporary promotional opportunity for Disney or is this a sign of lower standards and the overall “dumbing down” of WDW and its theming? I made my stance clear several weeks ago when I wrote about IronManorail. At the end of the day, the monorail is a mode of transportation, albeit a pretty cool one. It’s a way to get from one part of WDW to another and if they want to promote their new big film release for a few months, I see no issues there. I think the wraps are a fun way to promote their new movies and they definitely get people talking so they’re clearly doing their job. The wraps may not encourage every WDW visitor to go see the particular film, but if that wrap gets one out of every one hundred guests to see the movie, then I’m sure they were worth the investment. The Magic Kingdom is currently "play testing" the new pirate adventure game in Adventureland. While yes, this may appear as simply a lateral move (Sorcerers of the Magic Kingdom debuted just over a year ago) the theming is pretty dang cool and the fact that there are actual interactions with objects in the park gives this attraction the edge over SOTMK. A lot of people are concerned over the already congested area, now with two interactive games, but this appears to be a much smaller scale and less obtrusive than SOTMK. A few problems I have: I'm totally over Jack Sparrow, as of 2005...and the magic token (or whatever...) is kind of ugly. Mickey Mouse is evergreen. He's a character that Disney has been able to use consistently since 1928 in every medium imaginable for every market possible. And this summer, nearly 85 years after the character's debut, the studio that birthed Mickey Mouse is going back to its (and his) roots: a black-and-white cartoon. 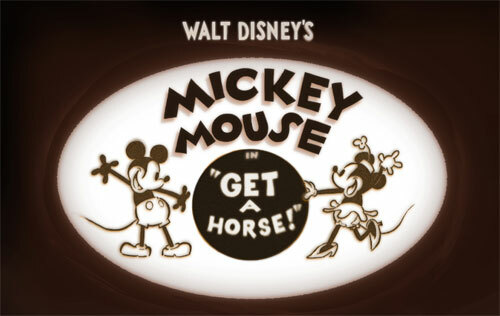 Walt Disney Animation Studios confirmed that Get a Horse! will debut at the Annecy International Animation Film Festival in France this June, and has billed it as a "never-before-seen" Mickey short. However, that brings into question whether it was unearthed from the Disney Archives like long-lost cartoons sometimes are... OR, it was created by modern animators as an ode to Mickey's beginnings. Mickey's voice track for the short is provided by none other than Walt Disney, his original voice, but still that doesn't clear things up. It's possible that Walt's voice was dubbed into new animation, just like vintage clips of Clarence Nash's voice were for Donald Duck in Mickey's PhilharMagic. Either way, we've got a new Mickey Mouse adventure on the way from the studio that started it all, and that is a reason for Mouseke-celebrating. It's hard for me to fathom changes to Disney's first cruise ship: the Magic. It's actually been the only cruise ship I've ever been on and there are so many areas filled with memories for me. I can't help but feel bittersweet about the rumblings of extensive updates coming to the Magic. It's true... the improvements are much-needed and some of the nooks and crannies (especially the Adult section of the boat) could use some refreshing. But with renovations including an AquaDuct, does this mean Disney also has the opportunity to raise the price on the older ship? BoardWalk Bakery is reopening tomorrow. And there was much rejoicing throughout the land! Honestly, this bakery has long been a hotspot for baked goodies and its closure, albeit brief, was lamented by many. Partially due to its prime location, as guests entering or leaving Epcot via the International Gateway had a good chance of passing by it, and in part due to its incredible assortment of all things found in the baking arts, BoardWalk Bakery had quite the reputation. 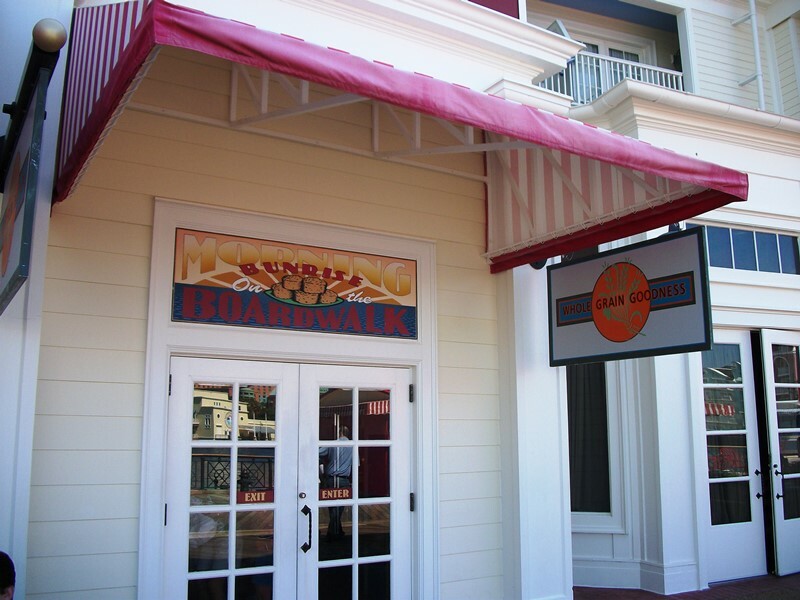 The refurbishment, lasting from the beginning of January through today, was more of an expansion than a dramatic change for BoardWalk Bakery. It has gained a larger footprint, courtesy of a portion of ESPN Club, and will utilize this space in order to transform the line for ordering into something a bit more functional and add a refillable mug station. The line-up of baked goods will be joined by an expanded menu that will feature salads, soups, and sandwiches. BoardWalk Bakery is a stellar example of how a niche dining experience can generate buzz for all the right reasons. 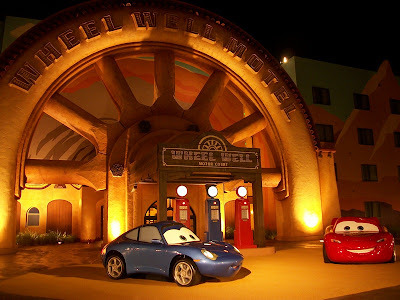 Its short closure, and much anticipated reopening, shows that when something is done right in Walt Disney World guests will find a way to flock to it. The success of BoardWalk Bakery, I hope, is a model for how other eateries will gain guests' attention and hold their appreciation.